I didn't grow up with religion, per se. I wasn't baptized as a baby or child and we didn't go to church. My parents seemed to believe in God, but not so much organized religion. We celebrated Christmas and Easter like other families, but faith was not a part of our everyday lives. Yet somehow I had BELIEF. It's like I was born with it. I can't imagine NOT believing in something greater than this, than myself. I've listened to what non-believers have to say, how irrational the idea of a God sounds to them. I often laugh at religious jokes because, yeah, a lot of it does sound absurd. I have a lot of issues with the Bible and how it's interpreted. But nothing I've heard shakes the feeling I have that there is a higher power, that prayers are heard, even that angels exist. It's simply this innate part of who I am. When one of my teen birthdays was approaching my mother asked me what I wanted. I told her I wanted a cross necklace. She asked me why and I told her it was because I liked what it symbolized. That it seemed to stand for ultimate love and sacrifice. She got me one. I think she liked my answer. My beliefs have evolved, morphed, deepened, waxed and waned over the years. In my 20s I made the choice to be baptized, confirmed and married in the Anglican Province of Christ the King (Episcopal, aka "Catholic Lite"). I was even our church's secretary for six years. I loved our church in California, and so did Mark. We had our daughter baptized there as well. Then we moved to Washington where there is only one parish that's part of the same body of churches, and it's a 40 minute drive each way. We did attend there several times and had our son baptized there.....but then we just kind of stopped going. Gas prices, time, small children, husband's retail work schedule....you know the drill. There is an Episcopal church in our town, but it isn't the SAME, so my husband hasn't wanted to give it a try. I have let it go, because I never did need church to define my beliefs. One thing I DON'T believe is that God gives a hoot about church. I think churches are places for like-minded -- or rather, like-believing -- people to come together on common ground for fellowship. I think that one can believe in God and not go to church. Not going to church anymore changes nothing about my belief in God. And actually, I now think that too many churches focus on the wrong things when it comes to preaching who Jesus was and it puts a bad taste in my mouth. It seems to me that ministers have lost sight of the amazing and inspiring being Jesus was. Too many people end up spewing hate and intolerance in his name, when those are the very last things he stood for. He was a man of peace, love, healing and forgiveness. 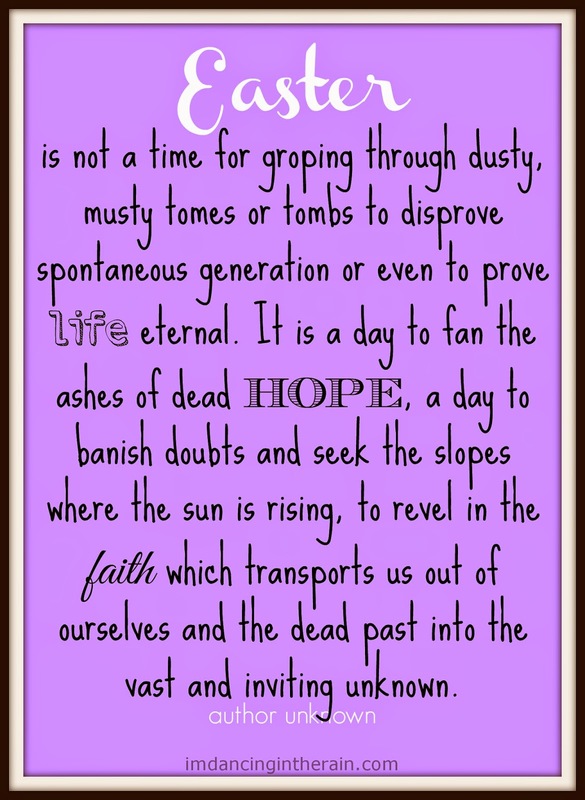 Stepping down off my soapbox: So what, then, does Easter mean to me? Well, I don't dig the Easter bunny. I just think a giant bunny who hides eggs and leaves chocolate is weird. No, I don't feel the same way about Santa. I don't think I can explain why. Santa is just cool; the Easter bunny is....strange. I do love spring, though. Spiritually, I love the deep and emotional meanings behind the long-standing traditions that have been handed down through the centuries. Our church would reenact the Stations of the Cross every year. It was always one of my favorite services because it made me FEEL. I felt for what Jesus went through as he was sentenced to die and ultimately crucified. It was so unfair, yet he did it with such grace. There is much to be learned from that. The Resurrection? Well, wow! I mean, Mary Magdalene going to Jesus' tomb but not finding his body there? Can you imagine? I think it must have been amazing. What I'm saying is, when it comes to Easter, I believe in what happened in history and who Jesus was. I believe those things happened and I honor them. I offer up a prayer of thanks and I feel at peace. I also believe in the renewal of spring and that deserves celebrating as well. I may not do it in a public setting, but I do it. More importantly, I feel it.